Magnum pickup truck racks are crafted and tested by people that drive trucks. These racks are not just stylish but are purposely built with your adventures in mind. Sure you can get a lower quality rack to throw on your truck and add some style but wouldn’t you rather get the real deal? Magnum racks are built from aluminum in order to be light and durable. These racks are custom made for each pickup model for the best fit. Check out our pictures, they fit clean and don’t overlap way past the trucks body lines giving you optimal style. And if that’s not enough you can get a magnum rack with lights or even cut out in the middle so you can use your rear sliding window! Another way we provide options for pickup owners. Take your pick high pro truck rack or low pro headache rack. That’s not all though, you can also get a rack for your service body truck and add lights as well. We also make the hollow point rack that has no rails in the middle. The hollow point rack also comes with or without lights. 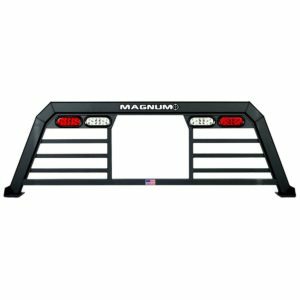 No matter what kind of pickup truck you drive you can get the best quality and the best-fit pickup rack on the market when you choose Magnum Truck Racks.